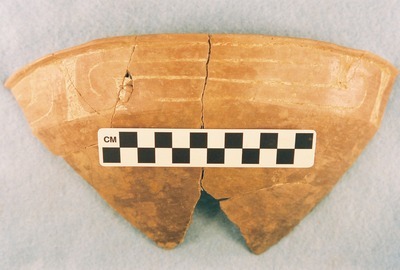 "41CP12, Burial 7, Pot 1" by Timothy K. Perttula and Robert Z. Selden Jr.
DECORATION: The rim has an engraved horizontal interlocking scroll repeated four times around the vessel. The scroll dividers and the interlocking elements are cross-hatched brackets. A white kaolin clay pigment has also been rubbed in the engraved lines. Ripley Engraved, var. Pilgrim’s carinated bowl, Burial 7, Pot 1.